Pour on most brands of pasta sauce and you pour on hundreds of calories. So instead, enjoy pasta with Walden Farms Calorie Free Pasta Sauces. No calories, fat, carbs, gluten or sugars of any kind. Based on old world recipes, lovingly prepared with crushed tomatoes, minced garlic, sliced onion, freshly ground herbs and spices and the finest imported and domestic aged vinegars. 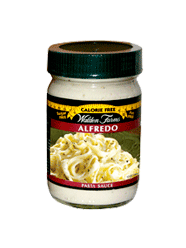 Enjoy all three delicious flavors of Walden Farms Calorie Free Pasta Sauces.